During the key moments that shaped South Africa’s transition to democracy, one photographer was there recording it all – Oscar Gutierrez. 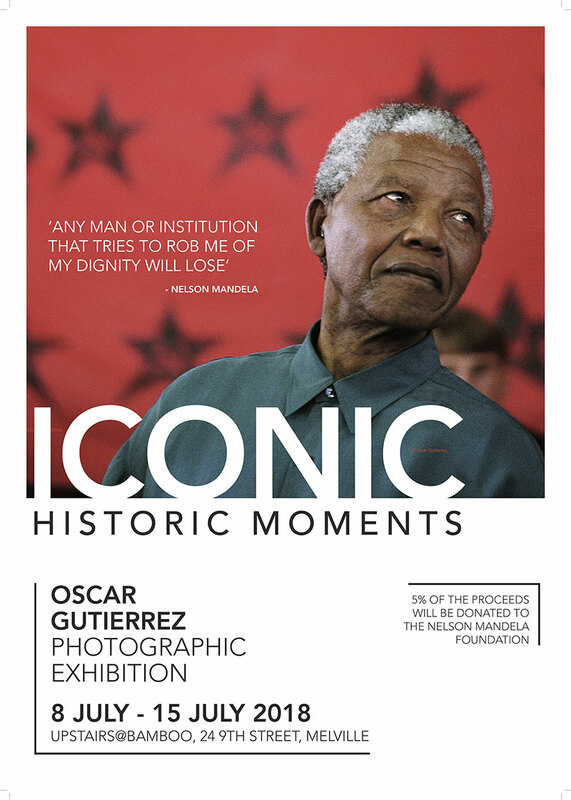 To celebrate the centenary of the birth of former president Nelson Mandela in July 1918, renowned photographer Oscar Gutierrez will launch his exhibition of the very best of those photographs. These glimpses into Madiba moments were captured by Gutierrez over the many years he spent tracking South Africa’s early democracy. The exhibition titled “Iconic” runs from the 8 – 15 July 2018 at Upstairs@Bamboo Gallery in Melville Johannesburg. The exhibition is curated by Oscar Gutierrez, in collaboration with Makgati Molebatsi of Mak’Dct Art Advisory & Agency. The photographs are on sale and 5% of all proceeds will go to the Nelson Mandela Foundation. Originally from Guatemala, Oscar Gutierrez arrived in Southern Africa in 1994 on assignment as a newspaper photojournalist and never left. Initially living in Mozambique but subsequently moving to South Africa. Gutierrez has covered and captured events and issues in politics, arts, culture, religion and social moments, developing an immense archive of significant moments in South Africa’s contemporary history. Prior to 1994, Gutierrez developed a wide range of experience as a photographer, extending from working at NASA’s Goddard Space Flight Centre in the US to honing his craft as a commercial studio photographer. His training includes a Bachelor in Fine Arts specialising in photojournalism from the Rochester Institute of Technology, Rochester, New York, as well as MA candidacy in Fine Arts.